Brian Canfield’s communications career began as a telephone installer in 1956. He climbed to the top of corporate ladder to become chairman and chief executive officer of BC TEL and BC TELECOM. As important as his business savvy has been to the economic development of British Columbia, Brian Canfield is a model corporate citizen. He played a significant role in making Science World a reality. He is honorary chairman of Leadership Vancouver, a program that fosters leadership from diverse and varied backgrounds. To date, over 100 individuals have graduated from the program. Past chairman of the Business Council of British Columbia, Brian Canfield is a member of many industrial boards as well as the Royal Columbian Hospital Foundation. In1997, Mr. Canfield became the first businessman to be presented with an Honorary Doctor of Technology by the British Columbia Institute of Technology. 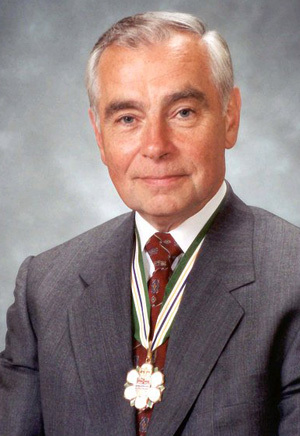 Mr. Canfield was invested in the Order of Canada in 2007.